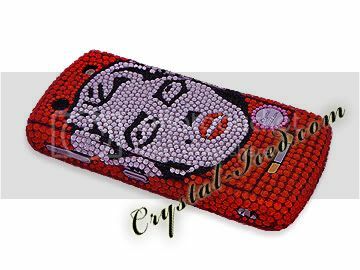 We were commissioned by the most stunning Suzie Kennedy to ice out her Blackberry Pearl with our Marilyn Monroe potrait in luscious red, white and black Swarovski Crystals. Suzie is one of the world's most famous look-alike's. A highly experienced Marilyn Monroe look-alike/tribute performer who has been performing all over the world for many years entertaining blue chip companies, royalty and high profile celebrities. Suzie has also appeared in many global TV commercials, films, music videos, documentaries and worldwide press. It was a real pleasure designing the phone for Suzie, who is a real star. Click below to check out Suzie's work, or should we say Marilyn's work?? :) No doubt the BEST Marilyn tribute performer we have ever seen..
and WOW, I want to have mine done. How much does this cost?